Democrats are starting to talk the talk and walk the walk in favor of strong unions. This pushback against the assaults on labor rights by anti-union governors and corporate-aligned judicial activists has been a long time coming. But it is becoming a real focus of the crowded competition for the party’s 2020 nomination. Now, the men and women who are bidding for the presidency have a chance to make that focus even more meaningful. They should all come to Chattanooga, where members of United Auto Workers Local 42 have filed a petition with the National Labor Relations Board seeking an election at the sprawling Volkswagen plant that has been the target of a multiyear drive to organize production and maintenance workers. 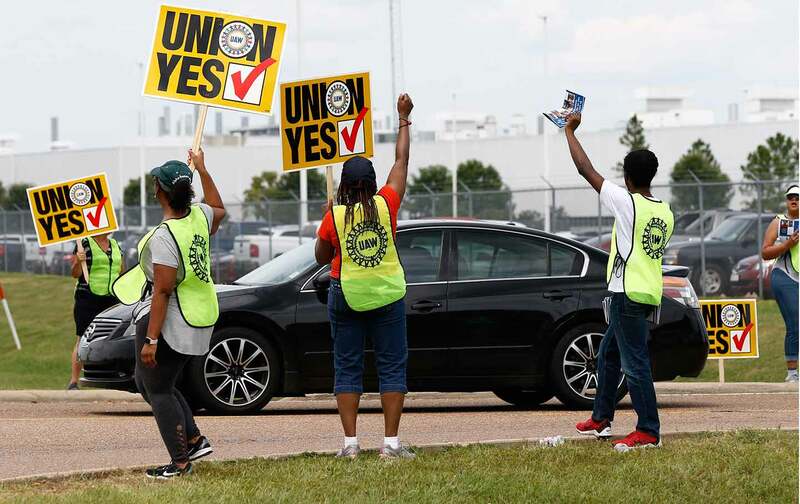 Organizers on the ground have already done the work that was required to get a new vote at the VW plant where a unionization vote was defeated by a relatively narrow margin in 2014. Presidential hopefuls should get specific about how they plan to renew labor rights in the South and nationally. Where better to have a Democratic debate than in the city where a labor struggle with enormous consequences is playing out? The Chattanooga fight has become a symbol of the struggle to organize workers in the Southern and border states where foreign corporations have located new manufacturing plants. Southern states, with their so-called “right to work” laws, have historically erected barriers to organizing. Multinational corporations know this, and they resisted efforts by workers to organize and collectively bargain in the region. “Why are Chattanooga workers treated any differently than other VW workers in the world?” asks Steve Cochran, president of UAW Local 42 in Chattanooga. “Why are Chattanooga workers treated differently than even other auto assembly workers at plants like GM Spring Hill?” That’s a great question—one that ought to be answered by everyone who wants to be president.